With Springtime right around the corner it is a great time to fill our diet with easy to digest foods in preparation for warmer weather and increased activity. Many people turn to harsh detox diets to loose weight and shed extra pounds they put on over the winter. These types of diets deprive the body of important nutrients and brain nourishing fats which leave people feeling hungry and craving more food. A better solution is to nourish yourself with light, easy to digest nutrient dense foods that satisfy and energize the body. 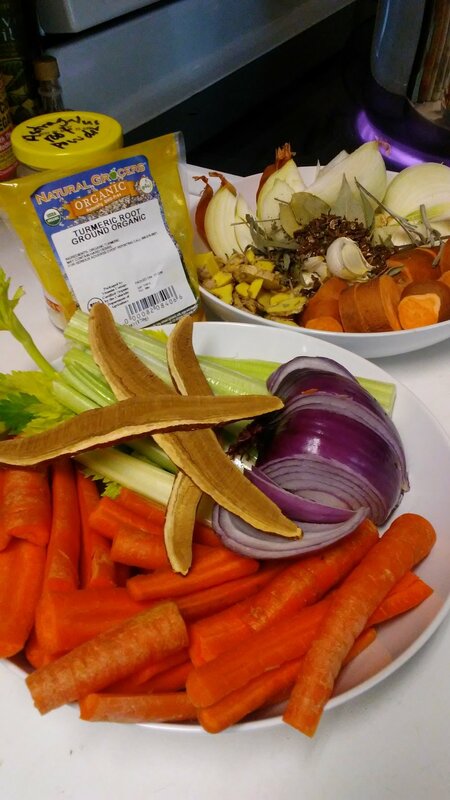 To help you get started here is my latest recipe creation for a Nourishing Vegetable Sipping Broth. The inspiration for this broth came after I was offered a tasty vegetable broth as a warm '"tea" at a friends house. I have been enjoying this warm broth in the morning with a light breakfast and for dinner with a salad. It leaves me feeling energized and very satisfied, I hope it does the same for you. Fill a 12 qt. soup pot with 9 quarts of water and begin to cook on high heat. Add the lemon juice and pulp, salt, pepper, and turmeric to the pot. Wash the carrots, celery, green onions and sweet potatoes, set aside. Leaving the skins on, quarter the onions and lightly smash the cloves of garlic. Set them aside and begin to chop the other veggies. Cut the ends from the unpeeled carrots and chop them in half lengthwise. Chop the stalks of celery in half lengthwise leaving the celery hearts whole with the greens in tacked. Chop the unpeeled sweet potatoes into chunky rounds. Chop the green onions in half and remove the roots. Slice the unpeeled ginger root into 1/4 inch slices. Crumble the roasted Nori and add it to the pot along with the Oregano and Astragalus Root powder. Add the veggies and remaining ingredients to the pot, stir. Bring to a roaring boil then lower the heat to medium/low, cover and simmer for 3-4 hours. Stir very occasionally and give the broth a taste. It should be lightly salty and mildly spicy but not overwhelming. Add more salt if necessary although it is not intended to be a very salty broth. At the end of 3-4 hours, turn off the heat and allow the both to cool about 10 minutes. With a slotted spoon, remove the veggies and herbs from the pot and place them into a bowl. The veggies are actually quite tasty and can be eaten if you wish, compost that what you don't eat. There you have it, nourishing, golden veggie broth. Ladle into mugs and sip until your hearts content. Store the broth in glass jars in the refrigerator for up to 7 days or freeze what you don't need for later use. This broth would make a very hearty base for any vegetarian or vegan soup. Enjoy! *If you don't have access to a 12 qt. soup pot, simply make this broth in the largest pot you have and adjust the amount of ingredients as you see fit.